Let our professional design team turn your dreams into reality! 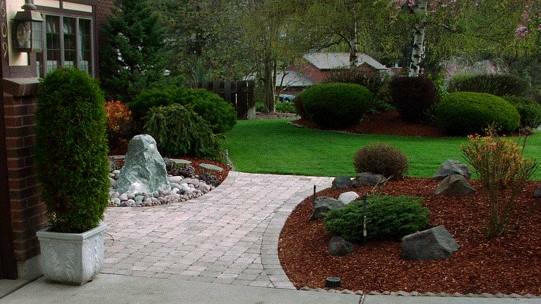 Our design team has experience with segmental pavers, retaining walls, irrigation, water features, boulder placement, and tree & shrub selection. Let us put the entire project together or break it down in manageable stages that can be completed over time. We are willing to work with your ideas and budget. Please contact us for a free consultation today! "I could have not been happier with the process, the people with whom I was involved, or the results of the landscaping project. The personnel were very professional, polite, and respectful at all times. The workers were equally professional, hardworking, and obviously conscientious about the quality of the work. The entire process flowed very fluidly from start to ending including the landscaping, installation of the sprinkler system, and sodding of the yard. The place looks beautiful and it is with pleasure that I highly recommend C & C Yard Care. Larry,L. M.D." Our crew members will truly impress you!